I'm a magazine junkie. I would go to a 12 step program but I'm so busy looking at all the pictures of great food I just don't have time to go. No 12 steps for me, but I do think I could fit in time to go to Borders today and pick up one more cooking magazine.... if I don't have it already. It's the time of year to look at great food. Not that I'm going to cook it all. I've already given up that illusion. But I do like to try several new things for the holidays. This one has me in trouble. I guess my husband has been reading it. He told me this morning that he has found the perfect recipe in the magazine. The recipe he found was in the dessert section. He must have really been studying the article...because he found this one and there wasn't a picture to go along with the recipe. Who can go wrong with Brown Sugar - Pecan Cupcakes with Caramel Frosting? I think I will have to make this one for him. I was thinking more in the line of a new cranberry relish recipe.....These look great to me! This is my seasonal favorite. I get the new one every year. It's all about the butter! And let me assure you, these all have the butter. I let each family member give their "cookie reviews" in the margins of the magazines. 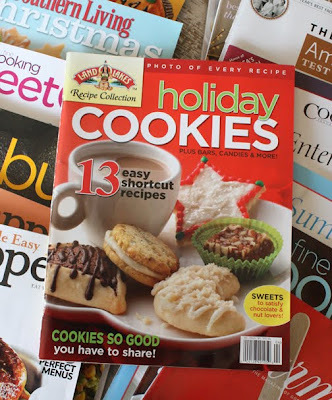 They have all written very funny and clever cookie critiques. 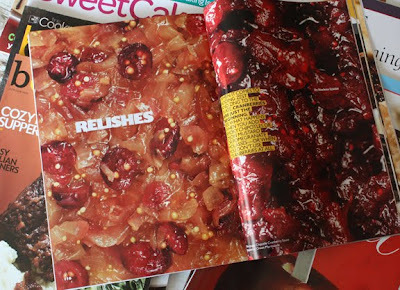 Thumbing through the older issues bring back wonderful memories of tasting, laughter and lots of sugar and butter. I highly recommend this magazine for family fun and calories! Without further ado here are the winners of Saturday's contest. Those recipes do sound good! I'm going to have to dig that mag out of my magazine pile. I love magazines too! lol! Just looking at the magazines is making me drool! Good thing my stitching is not in hand! My favorite cookie is the recipe I got from your old website for iced cookies - last year I made a second batch and hid them in another cupboard so no one else could eat them! Magazines exspecially cooking mags are always fun. Remember, looking is aways calorie free and even burns calories by wrist action exercise of flipping the pages and lifting exercises by moving the weight of the stakes of mags around from place to place in the house. Just a few tips from a fellow magazine junkie. I love the Land of lakes sesional magazines too. You can never go wrong with "real" butter. An amusing anticdote is that my mother loves butter, a real butter adict that has been pastdown from her mother. The story goes that when my father married my mother that his portion of their vows included that he would "love, honor and always allow her to buy Butter for the table". And she has, it has even gone so far as she and I made butter the old fashion way from heavy cream. Another long story in itself but needless to say, butter is not that exspensive to buy and I would pay any price that it was to have the convience of buying it at the store. A few years ago my family put together a cookbook so the favorites could be handed off to the next generation - really fun project! 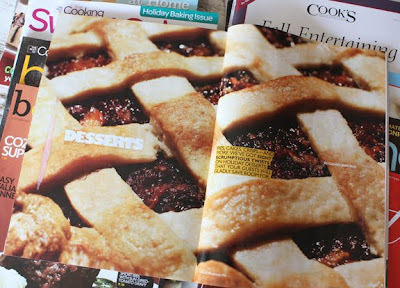 Oh, cooking magazines - my weakness! I LOVE homemade cranberry relish. I did hate the canned stuff growing up; then I realized that canned cranberries might be like canned spinach--a different animal from their fresh/frozen iterations. How sweet your husband is! That sounds like something my dear boyfriend Marc would do find it in spite of no picture. Who says men are all visual? 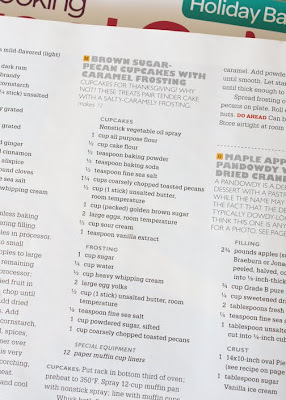 (Though he'd find something peanutbuttery) Those cupcakes might be hunt-down-the-magazine, break-the-diet worthy! Tell your husband (Creepily enough, I remember his given name's initial is "D" from Sunlit Sky, though I can proudly say that I quite normally subbed in our own personalization. :P) he has excellent taste. And to keep that mag away from Marc! O.k. I am addicted to magazines also. We need help, heck no we only need more magazines, and more stitching stash. Thank-you for a fun site. Yay, another 'food' magazine junkie. I am not alone. I can't wait to tell my husband I am not the only one!! 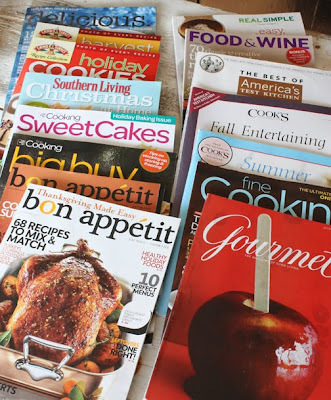 I love cooking magazines, cook books, etc. I too love magazines, but I just had to quit subscribing, because I wanted to keep them all!! Love the recipes. All those food photos look so delicious! There is something very comforting about a good recipe this time of year. 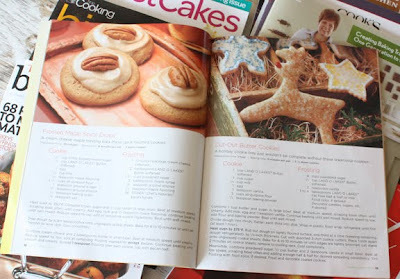 Yesterday I was thinking about what type of cookies to bake for Christmas! Lots of cooking going on in your house. Yummy stuff. I'm so excited to have won, thanks Alma so much. Love Christmas cookies and aren't old favourites just the best? Fellow junkie here. 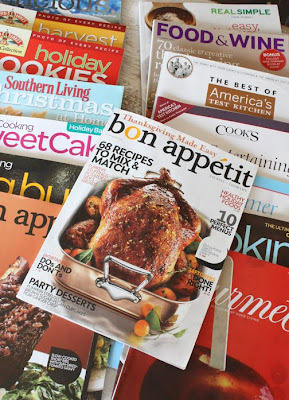 All types of magazines... home, decorating, cooking, knitting, and especially quilting! I just decided I need a little pre-holiday dieting and all those food photos look so good! I love to cook to. i even was a real cook on a French estate; guests could join a 'table d'hotes' and eat together with all the guests. The first day they did feel sorry for me we had as much as 32 guests at the table, but the last day that summer it was over 60 people! Boy, I know how to cook for large groups now. No problemo!!!! The Holiday season is my favorite time of the year to unpack all my knowledge and the beste ingredients in the kitchen. I feel very sorry about the fact that I recently found out I can't have sugar, makes me sick. BUT.... I now have a certain kind a sweetner maid out of corn. Looks like honey and is a natural sweetner. I love to bake with it and go at my first attempt soon. Lots of love form the Netherlands. I just made Chocolate Pecan Pie Truffles from Oprah's Nov. issue. The desserts were all tempting but these are going to poker night tonight. I always reccomend the Land O' Lakes web site for recipe hunting - you're absolutely right, it's all about the butter. Yummm. I love magazines, too! All kinds - even catalogs! We had our guild meeting a week ago Saturday to celebrate our love of your designs. 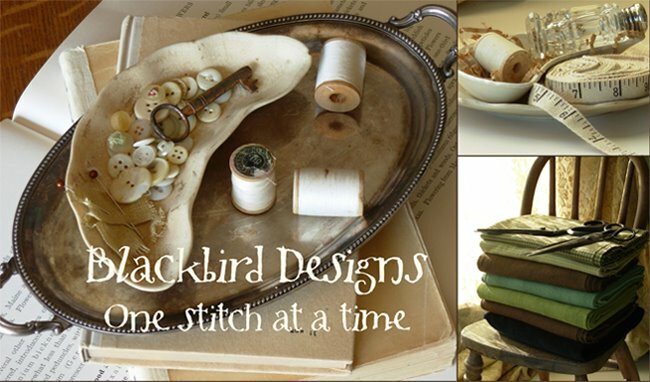 I hope you'll pop over to my blog to see some of the beautiful work everyone brought in. It was a really fun day and I'd like to thank you for contributing our door prizes! We raised a nice amount of money for our guild as a result! Thank you! Oh thank goodness- I thought I was the only one! Last week I was in the store with my husband and he caught me buying another magazine, and I said to him, "I'm an addict- help me!" The guy in front of us in the line smirked- no doubt, his wife is a junkie too! I'm a firm believer in using butter in cookies - what's the point otherwise? They are cookies! and as we all know, if you hold the cookie way up high before you eat it, the calories get scared and fall out! Easy!